On Monday morning the Blackhawks announced deals with four players. Forward Dominik Kahun, defensemen Lucas Carlsson and Darren Raddysh and goaltender Kevin Lankinen have all inked deals with Chicago. Kahun, Lankinen and Raddysh signed two-year, entry-level contracts while Carlsson agreed to a three-year ELC. Kahun, 22, has been the most intriguing European free agent on the Hawks’ rader this spring. 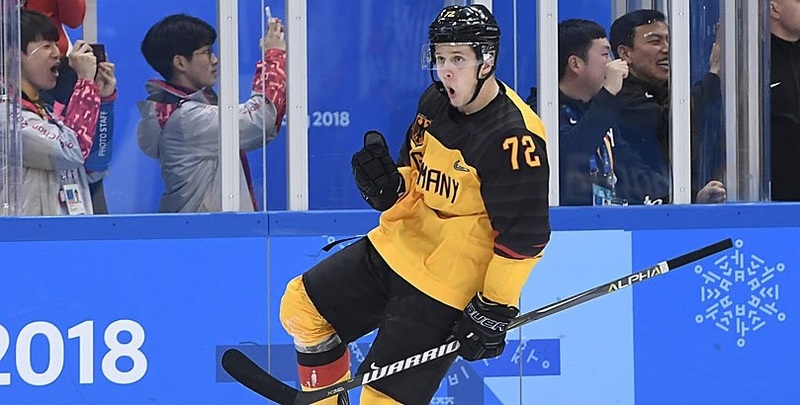 After posting two goals and three assists in seven games at the 2018 Winter Olympics as Germany won the silver medal, he finished a solid season with EHC München of the Deutsche Eishockey Liga. Kahun scored 12 goals and added 29 assists as München won their third straight DEL title. Kahun also had four goals and 10 assists in 17 playoff games. He then had three points for Germany in the recently completed IIHF World Championships. Carlsson, who turns 21 on July 5, was a sixth round pick (#110 overall) by the Hawks at the 2016 NHL Draft. He had 17 points (seven goals, 10 assists) in 41 games for Brynas IF Gavle in the SHL this season. He was impressive and caught the attention of scouts and the Hawks throughout the 2017-18 season. He’s listed at 6-0 and 190 pounds. Raddysh, 22, signed with former Erie teammate Alex DeBrincat before the 2017-18 season and had a nice first professional season in Rockford (which is still going in the AHL playoffs). Listed at 6-1 and 200 pounds, he had 22 points in 66 regular season games for Rockford. Lankinen, 23, appeared in 15 games with HIFK in the Finnish Elite League in 2017-18. He was good, too, posting a .946 save percentage and 1.33 goals against average. He followed that up with a 1.99 GAA and .936 save percentage in 13 postseason games. Congrats to all 4. Obviously well known the hawks were signing Kahun. Wasnt sure if they were going to wait on carlsson but good to see either way. Raddysh nice first year on an ahl deal. You almost had to give him an entry level deal. Some nhl would’ve offered. Don’t know anything about the goalie. Not many games with HIFK but good numbers none the less plus looks like he was really good in the postseason. Will be interesting that’s 44 contracts counting their rfa’s. Should be a fun offseason. Looking forward to the draft and the early days of free agency. Congrats to the golden knights also. Carlsson, Gilbert, Tuulola, Dahlstrom, Norell, Hillman. That’s 6 left handed defenseman who might wind up in Rockford next fall after Hawks training camp. Add to that Svedberg has said he wants to return and would rather play in the AHL than Sweden. No doubt competition is a good thing and the cream will theoretically rise to the top. Good to see the organization is pushing hard on drafting and developing. Also Snuggerud and maybe Forsling? Raddysh only RD under term. It isn’t impossible for a LH defensman to play the right side. Hammer did it most of his time with the Hawks. Lots of defensemen play their off hand side. Some are better at doing it than others. I don’t see that as a restriction at all. Norell was moved to wing at one point last year, I think he is a very long shot to make Rockford as a defenseman. Everyone else you guys named though are all solidly going to be in the mix for Chicago and Rockford. That is 7 quality young defenseman with NHL potential, and that is not counting Jokiharju or Mitchell. Wow…not counting Raddysh tho as I see him as more of an AHL guy. Camp should be mighty interesting this year. Glad that the Org keeps adding new talent on top of their drafted players. All these guys seem interesting. The Hawks have a TON of bodies on the blue line not that any of them are any good though. That being said I do like Darren Raddysh. The rub on him has always been his speed. He has always had plus vision and awareness. Looking at the success of playoff teams like Vegas I am not high on guys who have a speed deficiency. You need to be able to skate really well to be effective in today’s NHL. To be honest I am more intrigued by the potential of Forsling once he fills out his upper body more in a couple years. Guys with wheels like his are the future of where the NHL is headed. I feel that if we get rid of him now we will be looking at another Teuvo type situation when he is 24 years old or so. I think a few people said that about Forsling when the Hawks acquired him from Vancouver three years ago. He’s still only going to be 22 in mid-June but I think if the Hawks are going to look to make a splash in a trade this summer Forsling is a name to look to be included w/ a veteran. I can see why he would have trade value to other teams, for the reasons already mentioned. But unless the Hawks think Forsling just won’t put the work in to get stronger, I would prefer to hang onto him. He was 19 when he broke into the NHL his rookie year, that’s really young. I think the Hawks need more guys like him, not less, from the standpoint that he’s young, cheap, and only going to improve over the next 3-5 years. He has the wheels to play D in today’s NHL. Why trade a guy now and miss out on him potentially reaching his ceiling? Unless it’s for immediate help on the blueline…..
Glad to see the Hawks adding to the prospect pool. Not all will make a mark but a kid like Raddych who has worked his way up at several levels could prove to be a valuable prospect. On another note I knew it was coming but it was still sad to hear that Marion Hossa has stated he will no longer play hockey. Hopefully the Hawks will keep him in the organization. Have a wonderful life Hoss we will really miss you! Really looking forward to competition at the D positions and the continued seasoning of guys who can hopefully make an impact going forward. Hossa’s value on those teams from 2010 to when he had to stop was always a bit understated and underrated. And that is with him being noted as a premier player in the league. He brought so much versatility as a two way player, and his strength on the puck kept so many possessions alive. It is apparent now that he was likely playing through adversity with the skin condition he was battling, as well as dealing with the medical treatments/medications he was receiving for who knows how long. One of the greatest Blackhawks of all time, surely to be honored with his name and number in the rafters of the UC. Hossa got the Hawks over the hump! Having a lot of bodies on defence as mentioned does not mean these bodies can play in the NHL. And honestly, Carlsson, Gilbert, Hillman, Forsling, Norell, Tuulola? All very late picks which means potentially AHL players at best. GM needs to be successful in the first 3 rounds to have a core of talented players with real impact. Vegas for example, are not rejects from other teams. They have tons of 1st, 2nd, and 3 rd round picks. Look it up! Maybe one of them becomes a Nate Schmidt (free agent) but all these teams left in the playoffs, have real talent. Kahun, small German player with little success in CHL. Raddysh too slow…Carlsson a 6th round pick, and the goalie another longshot. These types of signings have been happening for the last 3 years but the real focus should be drafting talent: meaning speed, size and skill. And please draft a goalie from Canada but not Belgium??? And can announce the release of Osterle and Rutta? 2 names : Graham Knott and Matt Iacopelli? Probably none play with Hawks next year, a call up mid season at best be only hope of seeing any of them. None are can’t miss prospects but give them a chance to show what they can do before labelling them no good. If Kahun can adapt to smaller ice, he has the skill if he has that ability of Debrincat or Kane to find room on the ice to use it. I would bet on Kahun getting a really, really long look in camp. I would agree on the long look theory based on his contract and signing bonuses. It seems they are planning on this guy being a quality player. Either that or they had to max out his bonuses on the deal to get him to sign here….either way, they are there, so he will get every opportunity to make his mark in Chicago. There is no reason for the Hawks not to explore every avenue to bring in guys that might turn into something for them, because, unless you think Duclair and Jurco and guys like that are the answer to anything…..they Hawks have plenty of openings for good quality young players. He may get a long look in camp, seem to be higher on him than i thought. Alot of reports i read said he would need some time. What i saw at worlds with big ice he seemed to play hot and cold. He can play center too and looked decent on draws so time will tell. If he makes his bonuses like Panarin did we should be very happy to let it play out. Let’s not forget the upcoming draft. The Hawks have enough holes to fill so it is conceivable that their top pick makes the club next year – a la Debrincat. Debrincat was drafted in 2016 and returned to juniors for another season. Jokiharju and Mitchell were 2 top picks last year. So hoping for immediate help is asking alot. Carlsson is a 4th rounder. 110 overall.